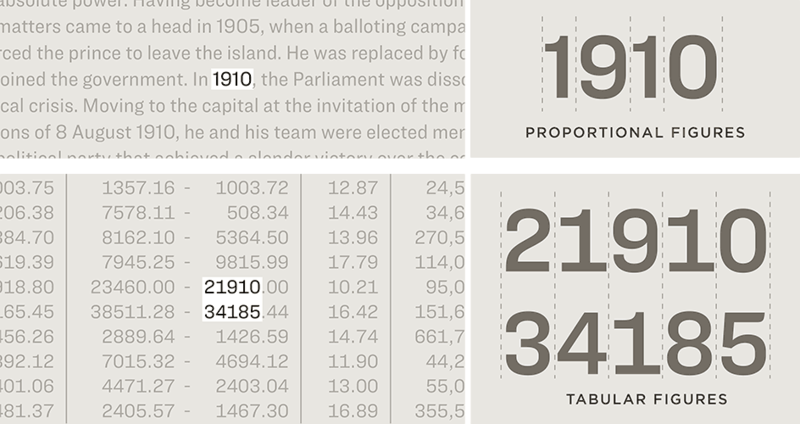 Ringside Font Features: Numerics | Hoefler & Co.
Tabular figures, built on a fixed width so that columns of data will align correctly, are provided in each of Ringside’s styles. In every width, these figures maintain consistent dimensions from weight to weight, to ensure that lines highlighted in boldface won’t disrupt the underlying grid. Every style includes not only tabular figures, but tabular fractions, monetary symbols, commercial marks and mathematical operators, so that prices expressed in dollars won’t affect the grid when the currency is presented in Euros. The family’s two most compact widths are designed for environments where space is truly at a premium. Ringside Compressed is a good candidate whenever content includes long numbers, such as financial statements, catalogs, technical notes, directories, or annual reports. Its next wider cousin, Ringside Condensed, is a reliable choice for data that includes large numbers of columns, such as weather, sports, or financial statistics. Ringside Narrow and Regular have the familiar visual rhythm of a text face. 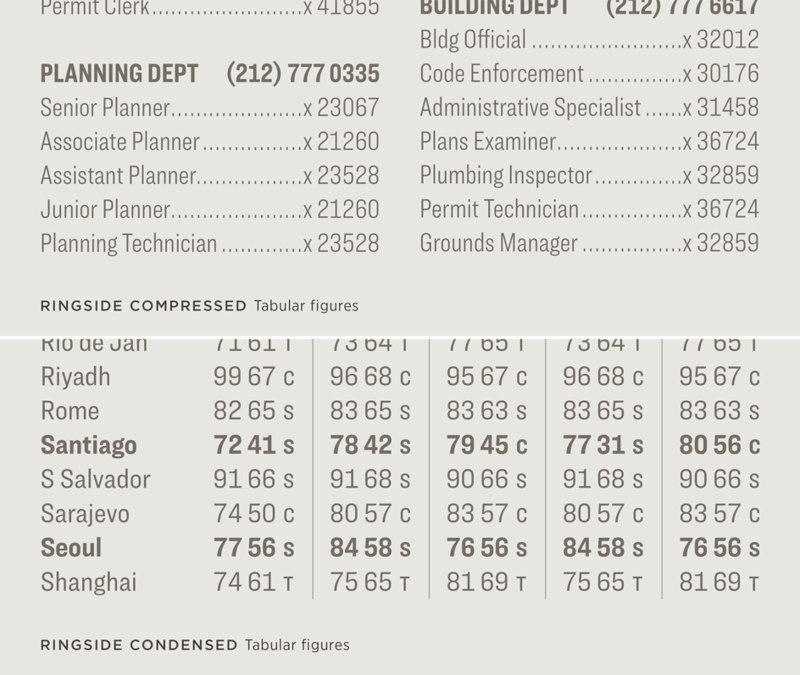 Both were designed with especially small sizes in mind, and include tabular figures that are carefully fitted to avoid appearing overcrowded. Compared with the more compact widths, these styles of Ringside have rounder sides and more open gestures, making them exceptionally legible when set small, even when choosing their heaviest weights. 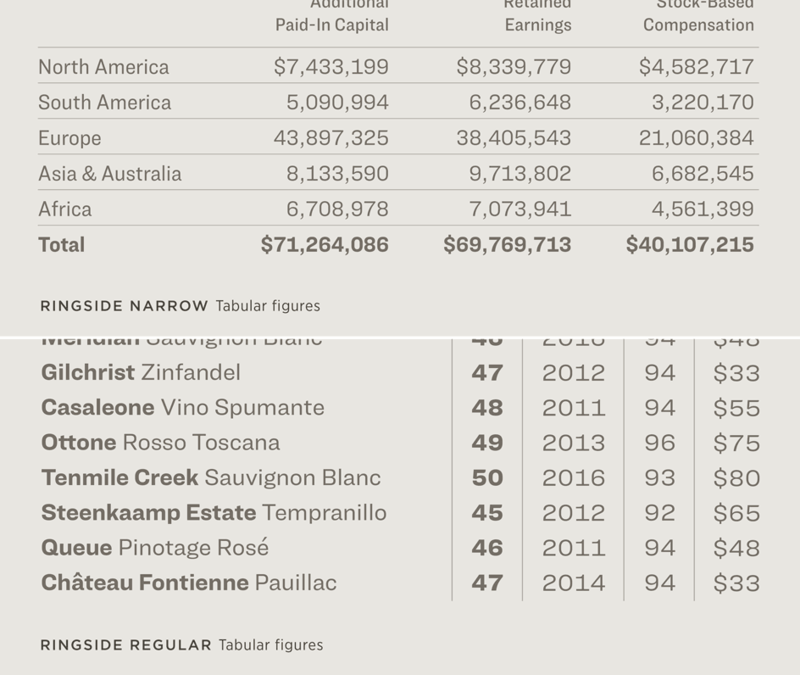 Wide typefaces don’t customarily have tabular figures, but Ringside’s two widest widths include them for situations where tables will include lots of short numbers, such as menus, price lists, tables of contents, or wayfinding programs. 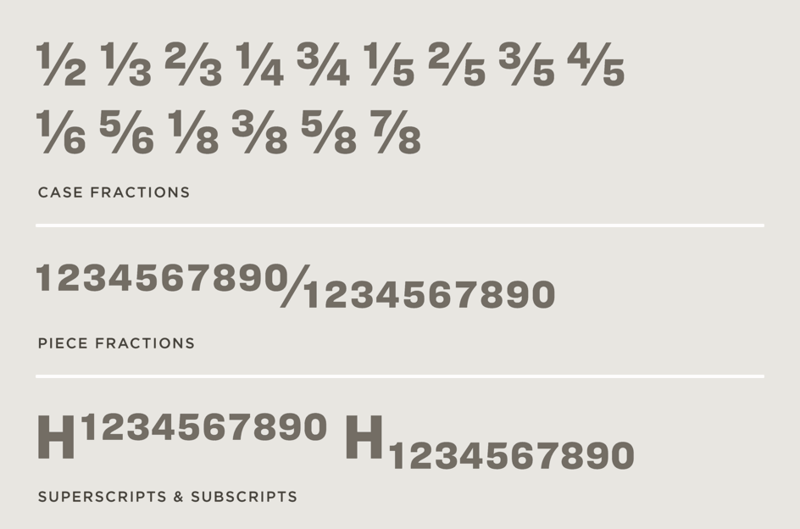 Typefaces with wide proportions can give prominence to short numbers that are easily overlooked, and help avoid the need to enlarge the text size. And the inclusion of scientific characters, such as superiors, inferiors, and mathematical operators, makes Ringside a reliable choice for presenting dimensions. Ringside includes readymade “case fractions” in denominations of halves, thirds, fourths, fifths, sixths, and eighths. Each font includes a full set of numerators and denominators, all properly kerned to the fraction bar, for creating custom fractions. Also included are a full set of superscripts and subscripts, for footnotes and formulae. In addition to the standard monetary symbols included in all Hoefler & Co. fonts (dollar, pounds sterling, yen, Euro, and cents) Ringside includes an additional ten symbols for the Baht, Colon, Naira, Peso, Ruble, Rupee, Rupiah, Won, and Sheqel.